Home » Articles » Again! Again! 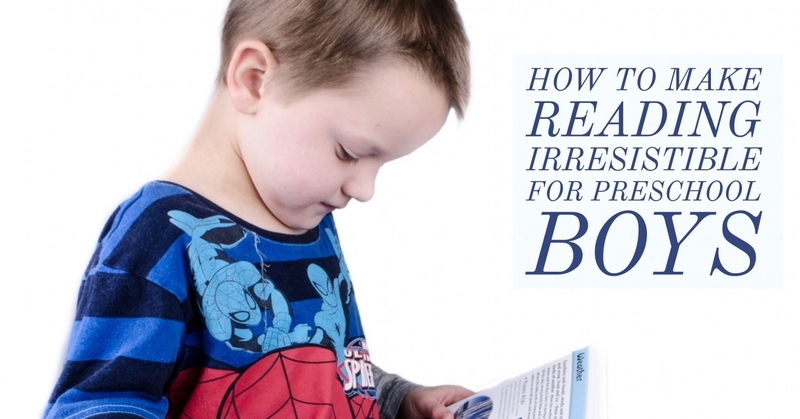 How to make reading irresistible for preschool boys. I have always wanted my son to love books. I began reading to him when he was a newborn. Despair descended when, at 6 months old, my son was more interested in eating books than reading them. But I wiped off the drool and kept reading. While my son now adores books, my concern for boys’ language development persists. The National Center for Educational Statistics reports that boys start school slightly behind girls, and boys as a whole don’t close the gap. In fact, it widens. Boys’ reading and writing skills lag behind girls’ even into college. Some differences are biological. However, the way parents talk to boys matters, according to Diane McGuinness, Ph.D., author of Growing a Reader From Birth: Your Child’s Path From Language to Literacy (W. W. Norton & Company). Parents tend to use separate styles of speaking with sons than daughters. Studies show that parents have longer, more elaborate conversations with girls than boys. Parents generally ask girls more questions than boys and engage girls in more verbal interaction. With boys, parents typically use a repetitive conversation style, asking simple questions again and again until the right answer is given, then changing topics entirely. McGuinness notes this conversation style isn’t as effective for language development. Though such books can be a starting point for elaborate conversations with your child, the simplistic books present no story unless you make one up. And finding the energy and inspiration for storytelling after chasing a preschooler all day is almost as hard as browsing for books with him in tow. Rhythmic and rhyming stories are favorite reads of preschoolers. These books should be introduced to all young learners. “The language has to flow, but it can’t be too wordy,” advises Jenny Rich, reading specialist and editor of the Web site Ethan’s Bookshelf. Plot and illustrations are also important. The best stories transport listeners from beginning to end, offering fun surprises along the way. To foster your child’s love of language, make reading a habit. Share stories at nap time and before bed, and follow these tips to engage your little linguist. Pretend you’re an actress giving a performance and really play out the language or sounds in a story, says Diane Schoenburg, Ph.D., developmental psychologist and mom of two boys. Kids love the cadence and rhythm of storytelling. Keep toys nearby that match characters in the stories you read. “Boys tend to be oriented toward the world of objects,” notes McGuinness. Encourage your son to hold an object like one in the book to occupy fidgeting hands and help him connect the written words with pictures and objects. Let kids see you read. Toddlers love to imitate grown-ups, advises Rich. Give your child a picture book and invite him to read next to you. If your son asks you to repeat a story again and again, take advantage of it. Though the characters are familiar, kids continue to be surprised by what happens next, says McGuinness, even if you aren’t. Repetition is stimulating because young kids cannot remember stories well. Bring reading on the road. Make books available for your child to enjoy in the car seat and grocery cart. Prompt your son to tell stories from the pictures he sees in the books. If reading is not your son’s activity of choice, don’t force the issue. Just try again tomorrow. Someday soon, he’ll be reading to you. These clever read-aloud books are parent-recommended and little-boy approved. Find them at a local bookstore or library. Rattletrap Car (Candlewick) by Phyllis Root [Amazon]. In this tumultuous story of a family trip to the lake, the rattletrap car falls apart, piece by piece. The characters ingeniously mend the car with toys and tasty treats. Bonus: Great sound effects abound for parental performances. Shiver Me Letters: A Pirate’s ABC (Harcourt) by June Sobel [Amazon]. “R” says the captain to his crew: Find me more letters! Young readers delight in pointing out letters in curious places and shouting “R” with the mates featured on the pirate ship. Blow me down— this version of the ABCs can’t be beat. Duck on a Bike (Blue Sky Press) by David Shannon [Amazon]. Follow duck on his first bike ride past each animal on the farm. Though they scoff at first, the curious animals can’t pass up of the chance to ride bikes, too. This beautiful tale portrays a barnyard on wheels. My Truck is Stuck! (Hyperion) by Kevin Lewis [Amazon]. A dump truck filled with dog bones gets stuck in a pothole in this whimsically illustrated counting book. Doggy drivers hitch up their vehicles to the truck in an effort to free it. It’s a revving, rhyming adventure. The Story of the Little Mole Who Went in Search of Whodunit (Abrams) by Werner Holzwarth [Amazon]. Kids giggle as the mole comes out of his hole one morning and plop!— he gets pooped on. Who knew bathroom humor could be educational? With entertaining but not-too-graphic illustrations, it’s hilarious reading for all ages. Heidi Smith Luedtke is a psychologist and freelance writer in Alexandria, Virginia. Read her blog on parenting as a leadership experience at www.leadingmama.com.